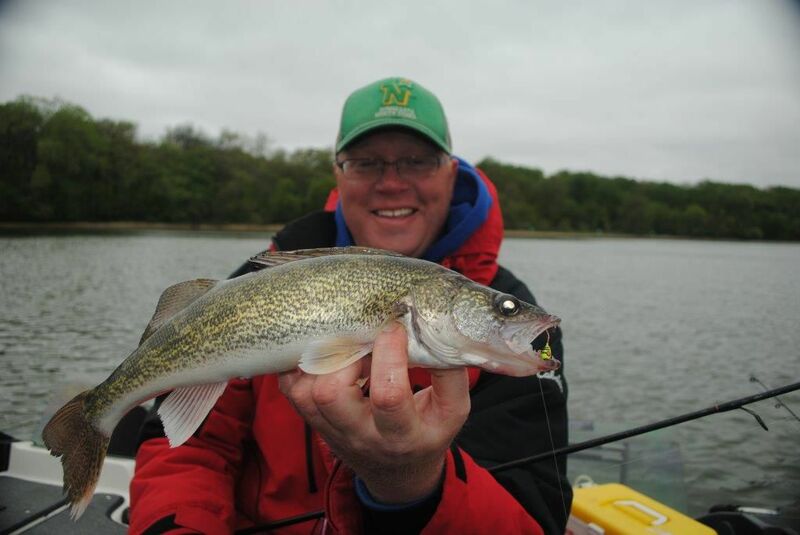 Bill Bunn with a jig-caught spring walleye from Clear Lake in north central Iowa. Clear Lake is an outstanding early season walleye lake. Bob Jensen's spring walleye jig box. 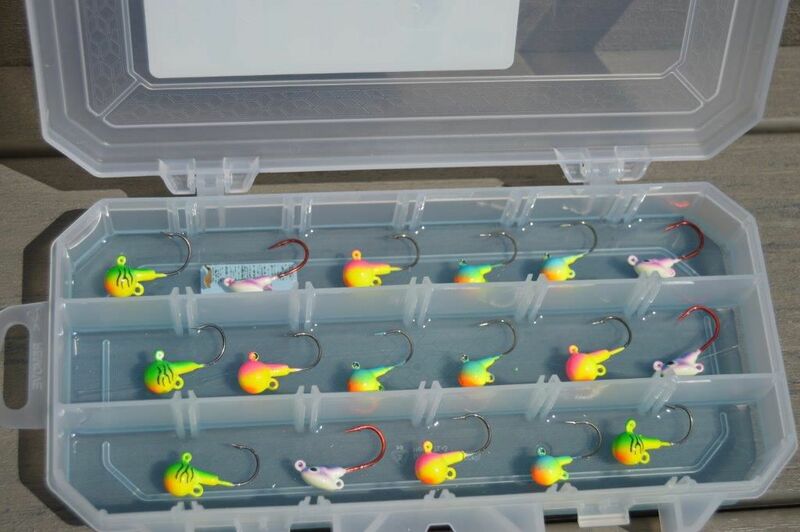 The Lure Lock box with its sticky surface keeps the jigs easy to see and prevents spilling. Many walleye anglers consider early spring to be their favorite time of year to chase their favorite fish. Rivers across walleye country, and many lakes and reservoirs in the same region, are seeing lots of anglers after walleyes. There are some states or areas where walleye season is closed, but there are plenty of places where we can get after walleyes right now. And, for many of those anglers, walleye fishing right now means jig fishing. Here are some ideas for catching walleyes on jigs during the next few weeks. Walleyes can be caught using a lot of different bait types, and most walleye anglers take most of those bait types with them when they go fishing. But in the early part of the season, you’re probably going to do OK if you just take your jig box, and in many places you’ll only need 16th and 8th ounce jigs. Not everywhere, but in many places. Walleyes are getting ready to spawn. They’ll look for areas with a sand or rubble bottom. In lakes they’ll seek out light current areas, in rivers they’ll want to be in areas where the current isn’t too strong. Many of the most successful walleye anglers will tie on a jig with a short shank and wide hook gap. Fire-ball Jigs are an outstanding example of this style jig. Walleyes prefer a smaller bait presentation this time of year, and with the Fire-ball you can provide that presentation. A minnow is usually the preferred addition to jigs for the first few weeks of walleye season. Put the hook in the minnow’s mouth and out the back of its head. By doing so, the minnow’s mouth will be right against the jig. This creates the image of a small presentation. In water with light current that is less than five feet deep, go with the sixteenth ounce size. In heavier current or deeper water, size up to an eighth ounce. This time of year, in many lakes and rivers, the fish will be shallow. We take them frequently in water only two feet deep. A slow presentation is usually best, and the lighter jigs allow for a slow presentation. If the fish are finicky, try fishing your jig under a slip-bobber. Under a slip-bobber, you can let the jig wiggle right there in the fish’s face, and a jig/minnow combo slowly wiggling can’t be resisted by a walleye very often. The line that you use is an important consideration. There are a lot of options. Some anglers like to go traditional and fish with monofilament. Mono is not a bad choice. Consider 6 pound test CX P-Line. It’s really good with light jigs and stands up to rocks and other underwater obstructions well. In the past number of years, more anglers have been using XTCB Braid in 15 pound test and then tying in a 6 or 8 pound test Tactical Fluorocarbon leader. The braid is super-sensitive and tough, and the fluorocarbon is invisible, so you get the best of 2 worlds. Snags can be an issue in some rivers, and with the braid you might save a few jigs. Last thing: Go with a sensitive rod. Early season walleyes are often light-biters, and a sensitive rod will reveal more bites. I’m sure that the Lew’s Custom Speed Stick Walleye Special that I’ve been using has added to my walleye catch. Team it with a Speed Spin CS200 and you’re set. However you like to fish, from a boat or in waders, walleyes are there to be caught right now. Maybe we’ll see you in or on the water.